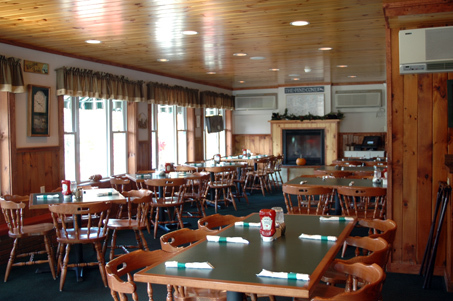 Relax and enjoy a cozy family-friendly atmosphere at the Pine Cone Cafe. Dine by the fire and try one of our many homemade dishes - serving fresh garden salads, soups, appetizers, an array of sandwiches, char-grilled burgers, chicken and ribs. For pizza lovers we offer our famous authentic Italian Pizza! Stop by our seasonal ice cream window, for convenient quick take-out orders. Print out our take-out menu. Visit us at the Bayside Grille and Tavern in Wolfeboro!